Mangalore was the first among my series of Exam duties to be confirmed. I hadn't booked tickets for quite a while, remaining confused about which bus to book on. 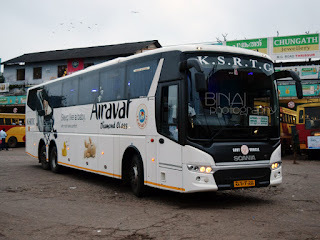 I had predecided that it would be by KSRTC - but the question was, which among the many Airavat Club Classes that operate at night! I also wanted to travel in a new bus - the new Volvo B11R. I spent most of my time trying to understand which all schedules got the new bus regularly. After a lot of searching around, I picked one bus that left past 2200hrs - this was because I was sure the day would be really busy at work, and I had to have some breathing time. I selected KBS as my pick-up point as well. The day was really hectic at work - a really busy day. I was quite tired and drained as I walked into my house well past 1900hrs after running around in office the entire day. I had no time to rest - get fresh, pack and get moving again - for the last of the exam duties for this "season". I started from home at around 2030hrs - by bus to the nearest metro station, and then by the metro to Kempegowda Bus Station aka Majestic. I was there by around 2145hrs or so. I had booked by the 2229BNGMNG schedule - I directly headed to terminal 1 to see if my bus was already there. It already was! A fairly new Volvo B11R, with chalk markings on the glass "2229" "2240" was parked at the platform. I was really excited to see a new bus for me that night. 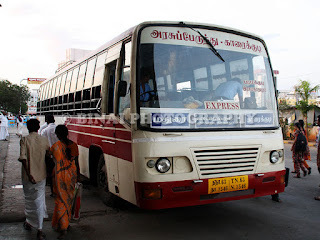 I hadn't taken my dinner yet - I rushed out of the bus station to a restaurant nearby and had a Masala Dosa for dinner and rushed back to the bus station. By now, the conductor was busy checking tickets and calling up some passengers. I hadn't received any message with the bus details yet (the message never came, either). I quickly checked with the conductor if it indeed was the 2229 Schedule - he confirmed. I got my ticket checked and quickly got into the bus. I was terribly tired - and just wanted to sleep. It seems they had clubbed two services that day, and the conductor was busy calling up passengers who were booked in the other schedule. They managed to get all the reserved passengers on board, and got a few walk-in passengers as well, and got moving from the platform by 2236hrs - it took us another 3 minutes to actually exit the bus station though. 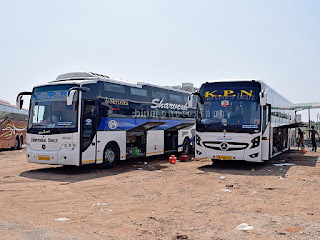 I had already adjusted my seat back and got set to sleep - I was actually half asleep by the time the bus got to the next pick-up point (Govardhan/Yeshwantpur) - where, we quickly picked pax and got moving (2300hrs). The bus took the elevated highway and picked pace quite fast as well. The engine was silent and the ride comfort was unparalleled. There was a bit of rattle - but that didn't sound to be coming from the body, but from some baggage that was improperly placed. I was fast asleep even before the bus turned off the Mumbai highway. I woke up when the bus was stopped at some bus station - did not notice the time or place - I slept even before the bus started from there. I had another round of good sleep, and woke up around 0600hrs, when the bus was just leaving from another stop. I slept for some more time, and woke up just as we pulled in to Pumpwell (0641). 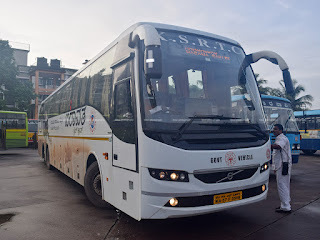 We stopped at Kankanadi (0643), Jyoti (0646), PVS (0650) and Lalbagh (0653) before finally completing the trip at Bejai KSRTC Bus station, at 0655hrs. Summary: The bus, KA-57-F-3599, of Mangalore-2 Depot had clocked a little over 34k kilometres. The bus was in stock condition - no comments on maintenance. Both the crew members were great - well behaved. The driving style was excellent - the iShift doesn't let drivers lug the engine - and a lot of drivers actually love it as well. 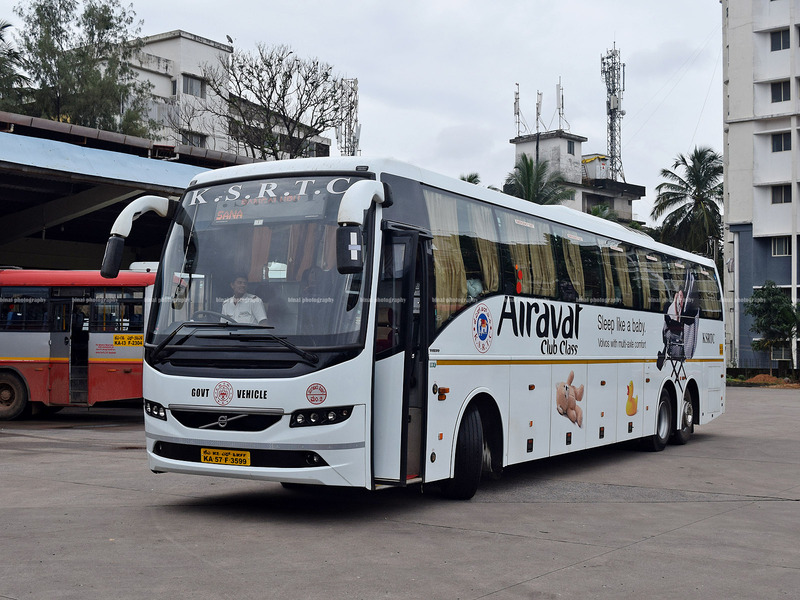 The buses are able to maintain speed and get to their destination on time as well - since the crew have no way of wasting time now! I loved the ride - it was soft and matured - took undulations very well. I loved the ride!